These ribs are incredibly flavorful, and if you’re looking for another Asian dish to try you’ll love my Orange Chicken, Mongolian Beef, and Teriyaki Chicken. 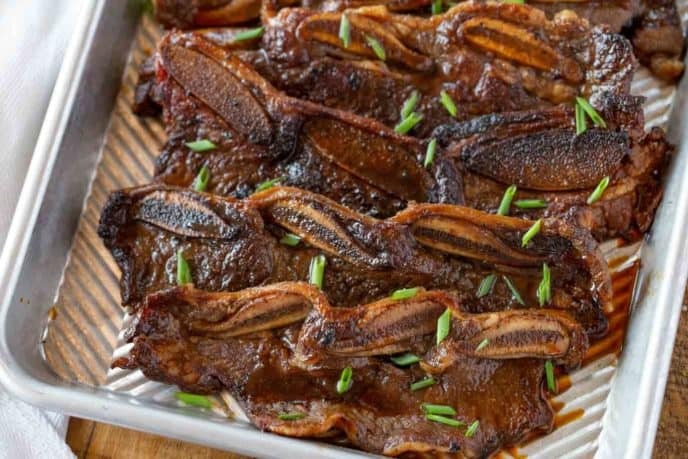 Korean Kalbi BBQ Short Ribs are the PERFECT combo of sweet and savory, made from flanken ribs in a marinade of brown sugar, sesame oil, soy sauce, mirin, and spices. It’s one of my all-time favorite Korean dishes because it’s also incredibly easy to make. 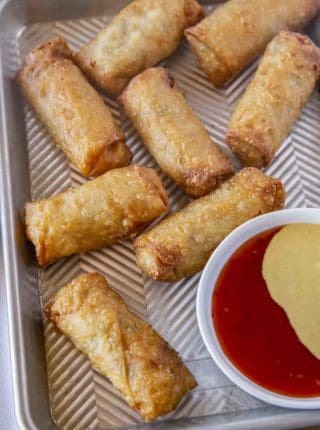 If you’re looking for some side dishes to serve with these ribs check out my Macaroni Salad, Fried Rice, or Egg Rolls. The best part about this Korean bbq is that you can make it all summer on the grill, and in the oven when the weather’s too cold. If you can’t find mirin at your grocery store, try replacing it with about 1/2 teaspoon of sugar per 1 tablespoon of white vinegar or dry white wine. WHAT IS THE BEST MEAT FOR KOREAN Kalbi BBQ? Kalbi is made with flanken-style short ribs, which means the beef is cut thin to around 1/2 inch thickness, and across the bone, leaving a few bones to each rib. Flanken ribs can be cooked quickly, which makes them best for beef rib recipes that call for broiling. WHAT DO YOU SERVE WITH KOREAN BBQ? WHAT IS THE DIFFERENCE BETWEEN BULGOGI AND KALBI? 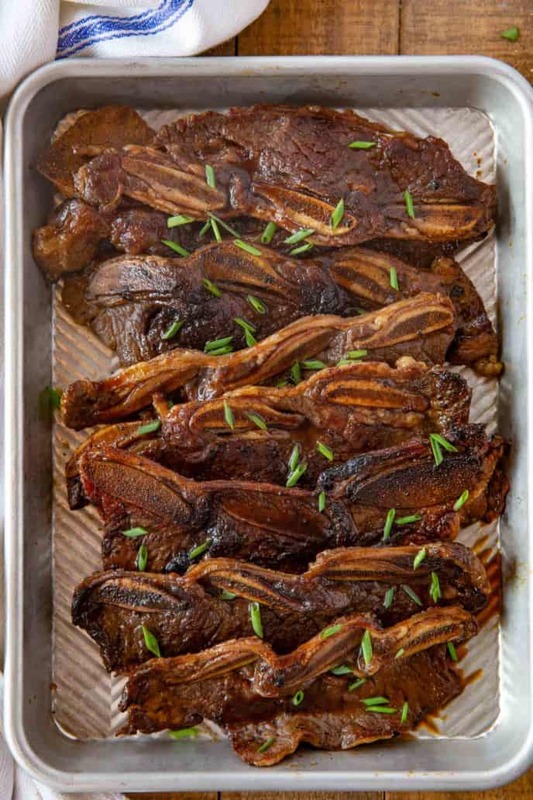 Kalbi (Galbi) is a recipe that uses short ribs, while bulgogi uses ribeye steak. Both of these dishes use a similar marinade. 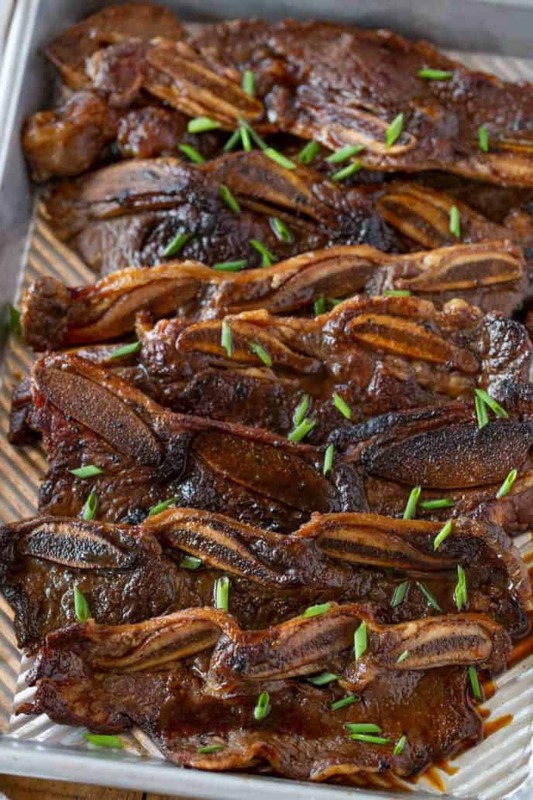 HOW MUCH KALBI (GALBI) SHOULD YOU MAKE PER PERSON? 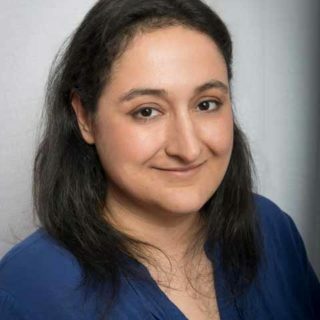 You should plan on 1/2 – 3/4 pound per person, more if you have some BBQ lovers because much of the portion is going to be discarded as bone or connective tissue. When planning for larger eaters I actually do 1 pound per person. Kalbi is marinated overnight, which means the marinade is a pretty big part of this recipe. 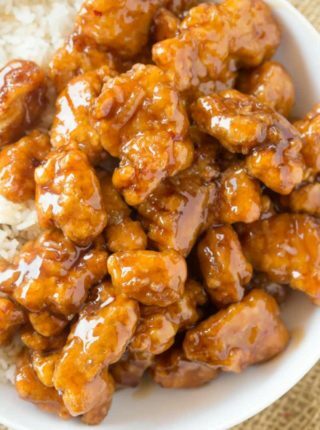 I like to use a combination of low sodium soy sauce, sesame oil, and mirin, with spices, brown sugar, and onion. 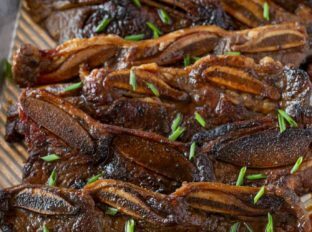 You can substitute the pear for kiwi in this kalbi marinade recipe. The fruit helps tenderize the meat, which is really important for the finished texture of your Korean bbq ribs. I recommend marinating the meat for a minimum time of 24 hours, because it can give the kalbi an amazingly sweet and savory flavor and soft texture. Slow cooking short ribs is a great cooking method because they get to the point where they’re falling-off-the-bone tender, plus they get to cook in their marinade all day long. In a medium bowl, whisk together your marinade ingredients. Add short ribs to the slow cooker, and pour marinade on top. Use a slotted spoon to remove short ribs from slow cooker and serve. Marinate your beef in the refrigerator as usual, for at least 24 hours before cooking. Pour the whole bag (ribs and marinade) into the pot. Lock the lid and seal the pressure valve. Set on manual high for 5 minutes, then allow to release naturally. If you want your Korean kalbi to be more crispy, place them on a sheet pan and broil for 1-2 minutes, watching closely so they don’t burn. 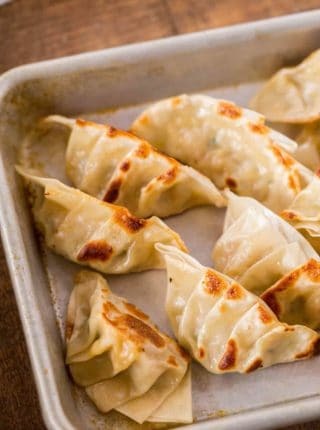 Add a sprinkle of sesame seeds over the meet just before serving. 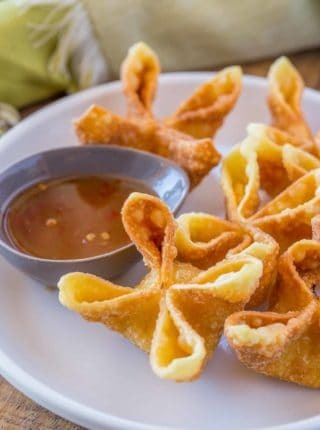 They’re decorative and they also add a nice flavor to the dish. You can also top with chopped green onions for presentation. Kalbi is often called Galbi, which is another way to say ribs. Galbi literally translates to “rib” in Korean. You can add some more spices like cayenne or black pepper to give your short ribs more of a kick. If you use Asian pears instead of regular pear, the recipe may turn out slightly different as Asian pears are usually crunchy, and have a sweet yet different flavor. You can serve this Korean dish just over white rice if you aren’t making any other side dishes. When cooking in the crockpot, do you still marinade 24 hours before placing in the crockpot for 6-8 hours. I don’t want the meat to become too grainy from being in the marinade for so long. Thanks!! No need to marinade overnight since it’ll be in the marinade while in the slow cooker. I hope you enjoy it! I’m always able to find them at Asain grocery stores. They’re just short ribs that are cut in the opposite direction than usual. Most butchers should be able to be knowledgeable about the cut style. Hope you enjoy it! These short ribs are heaven! So stinking good! Thanks, Rachael! I’m so glad you loved them! Can I just say that these are a hit! We absolutely love them. Short ribs alone are fantastic but give it this Korean flair and it sends it over the top! Fantastic, Alli! So glad you enjoyed them! Tender and flavorful. These turned out delicious. Great recipe! and so much info I have all the confidence to make these short ribs! These are out of this world good! Yay, so glad you enjoyed them! Thanks for the 5 star rating. Hi, I am new to slow cooking, does cooking on low for 8 hours make chicken and ribs more tender versus cooking on low for 7 hours, or the opposite? I’m not sure if I understand your question correctly. When cooking in a slow cooker, usually longer times mean the meat will be more tender though you don’t want to over cook it either. You’ll want to follow the recommended cook times in each recipe for the type of meat. Hope this helps!